Do You Have Cannibalistic Fish? This reader's question struck a chord with me because I've experienced what's happening to her -- her fish are eating other fish. It's probably happened to a lot of you as well. 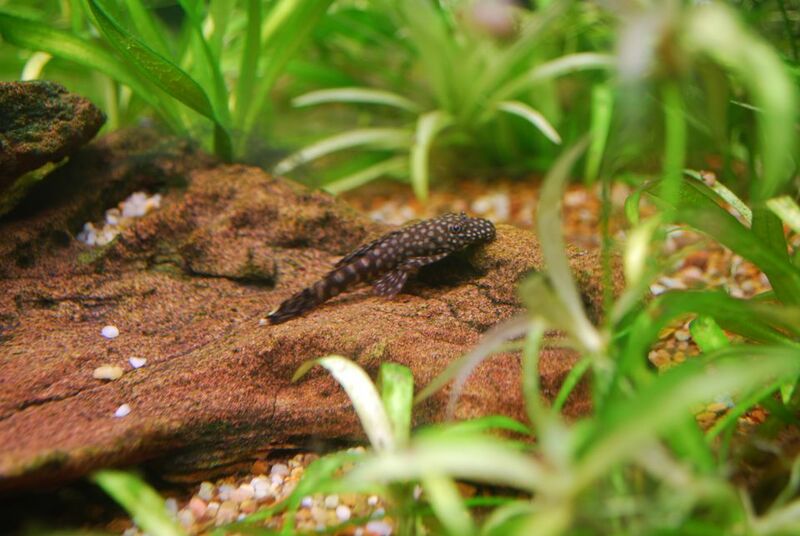 "I have two Bristlenose in a mixed tropical tank. I have noticed over the last few weeks that fish have been disappearing and I attributed it to my Red Tail Sharks, but tonight I found a very recent formerly healthy fish now dead. The fish was stashed up under the bridge that is the home of my adult male Bristlenose, and it was already half eaten. I am now wondering if he is the culprit behind the other disappearances. Has anyone else noticed this behavior?" I've seen the same theme quite often: A fish owner notices fish disappearing, then sees a normally peaceful fish feasting on the carcass of those that have gone missing. The immediate assumption is that the peaceful fish is actually a wolf in disguise. I thought the same thing when this first happened to me years ago. After seeing the corpse of my favorite fish being eaten, I was so incensed that I nearly executed the "guilty" fish. I decided to consult someone wiser than I before I did anything rash, and I learned a valuable lesson. He told me that seeing one fish eat another actually means very little. Other fish in the tank will quickly take advantage of the situation when a fish dies. Even a fish that is still alive but is very weak or sick will be picked on by his tank mates. Why does this happen? Fish are opportunistic, just like other living creatures. If food presents itself in any form, they will eat it. Sure, that food may have been their best swimming buddy the day before, but today he's lunch. It's all part of that great circle of life. So how does a fish owner know who, or what is the real killer? Sometimes it may be an obvious bully. Other times it could be a more peaceful fish, but it's also just as likely that it's not another fish at all. A series of deaths could be the result of a change in water conditions, an outbreak of an undetectable disease, or simply stress. The key is to carefully observe what is going on in the tank. This is particularly true if you've added new fish to the tank or anytime something changes in the aquarium. Stay on top of the habitat and know what your water conditions are to avoid invisible changes that can trigger a series of fish losses. New fish in a tank are under close scrutiny by the other fish. A pecking order exists even in a tank of peaceful fish. Territories have already been established and all eyes are upon the newcomer to see which space he will choose. If the other fish become threatened in any way, quarrels my break out, even with normally peaceful fish. Observe all the fish closely any time you add a new one to the tank. If you see any signs of aggression, use the old standby trick of rearranging the decor. That alters the previous territories and can settle things down. Make sure there are plenty of hiding places for everyone, even if it means adding more plants, rocks and other decor. You may have to remove either the aggressor, of the object of the attacks if the aggression continues. An ammonia or nitrite spike is an invisible but not uncommon problem that can occur in even a well-established tank, particularly when new fish have been added. This can tax the biological balance in the tank, resulting in a brief spike of ammonia followed by elevated nitrate. The new fish are under stress already due to being caught, bagged, transported and introduced into an entirely new habitat. Consequently, they're more susceptible to succumbing to even a modest spike in ammonia or nitrite. It's also possible to briefly alter the balance in the nitrogen cycle when water changes, filter cleaning or other types of maintenance are performed. Things will usually settle down quickly, but fish that are already weak can succumb to the stress of the changes in water conditions. A chain reaction can occur -- one fish dies, adding more organic toxins in the water, and another fish that is already stressed dies. The domino effect can appear to be a killer fish when it's simply the result of weaker or older fish falling victim to what is happening in the water. Tracking water parameters will help to alert you to such changes and help you identify what the true "killer" is. A disease can also be the culprit behind a series of fish deaths. Not all diseases are obvious, which is why quarantining new fish is recommended. Perhaps that new fish you bought was already infected when you put it in with your other fish. Between the stress of being moved and the disease, the fish went belly up the night after you brought it home. The other fish discovered the body the next morning and quickly went to work feasting on their newfound breakfast buffet. Now they are all infected as well. One by one, they become sick. Some of them may survive, but others that are weaker may perish and be eaten by their tank mates. Are any of them killers? Nope, but if you find a pleco with a body stashed in his favorite hiding hole, you'd probably wonder. That's why it's so important to quarantine your fish and to stay on top of everything going on in the tank. Keep a journal so you know the normal behaviors of all your fish. Track the pH, ammonia, nitrite, and temperature so you can see if something is changing in a not-so-good way. Step up your observations whenever you add new fish or make a major change in the tank. You aren't as likely to lose any fish when you know your tank. In the event that you do lose some, you're far more likely to know who or what the real killer is. Do I Need an Aquarium Heater Guard?